There is still much speculation over the probable action of the Fulton county grand jury on the Felder-Beavers –Lanford controversy, and it is not yet known whether or not the grand jury will make an investigation. 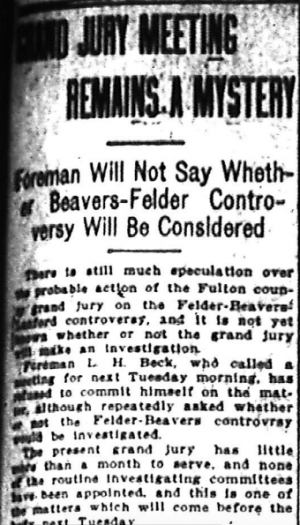 Foreman L. H. Beck, who called a meeting for next Tuesday morning, has refused to commit himself on the matter, although repeatedly asked whether or not the Felder-Beavers controversy would be investigated. The present grand jury has little more than a month to serve, and none of the routine investigating committees have been appointed, and this is one of the matters which will come before the body next Tuesday. Chief of Police Beavers, who has requested a grand jury investigation, has not seen or communicated with Foreman Beck since the controversy commenced, according to the latter. Chief Beavers, however, is expected to thoroughly into the case with Solicitor Dorsey on Monday, and then he will repeat his request for a grand jury probe of the charges against himself, his department and the charges against Colonel Thomas B. Felder. Solicitor Dorsey states that he does not know the object of the special meeting called by Mr. Beck. Should the grand jury take up the Felder-Beavers matter, it is very probable that no bill against an individual will be presented for consideration, but that the grand jury will simply have an exhaustive hearing, examining many witnesses and that then it will embody its finding in the usual report to the court.